These are antique cast iron figures. We have a small and large cast iron piggy bank, a larger scale Statue of Liberty, and a cast iron pug dog. All cast iron figures are sold. 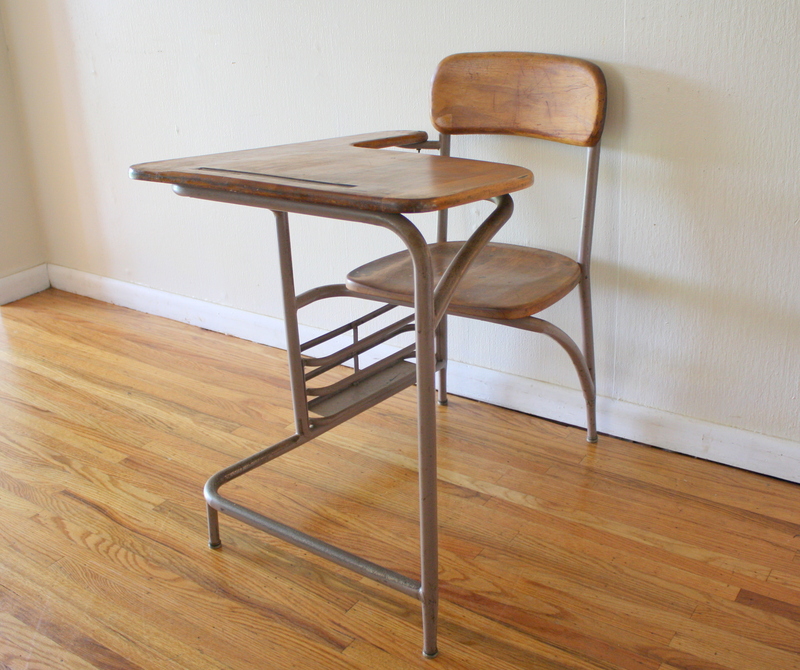 This is an antique Heywood Wakefield school desk and chair, circa 1940s. It has a tubular industrial steel frame, solid maple wood desk top and chair seat and back. The steel frame has a book supply holder on the side. Dimensions of chair: seat width: 15″, seat depth: 16″ seat height: 17″, back height” 32″. Dimensions of entire unit including desk: 22″W x 31.5″D x 27.5″H. These are 3 antique solid wood cabinets with glass doors. The first cabinet has a glass doors and an antique glass knob. The second has its original leaded glass. The third has glass doors and a wood knob. Please check captions for prices and availability. 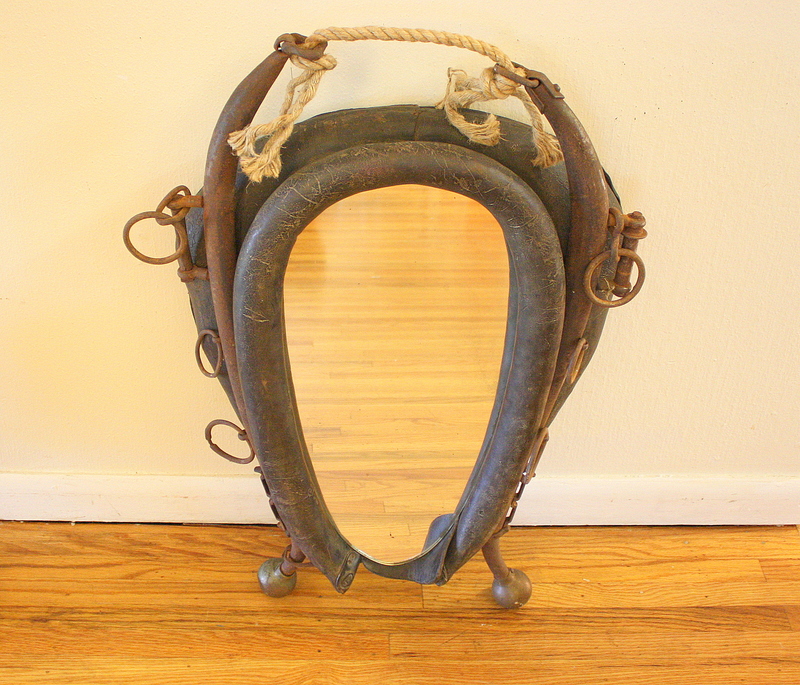 This is an antique horse yoke repurposed into a mirror. Perfect rustic accent for the equestrian or ranch themed home. These are vintage international and domestic museum prints. Sold in our July Fab.com sale! Hi PV’ers! Check out what sold in our July Fab.com Sale! This is an industrial coffee table with an antique jack base and glass top. Sold in our March sale on Fab.com! Check out what we sold on Fab.com in our March sale! Sold in our February FAB.COM Sale!!! Check out what sold on our last Fab.com sale! This is a vintage papier mache nativity scene that was made in West Germany. Most of the figures are marked Made in West Germany. All the figures and animals have beautiful patina. The stable is made of solid wood. Picked Vintage Holiday Sale featured on Fab.com! And we are very excited for the next sale which is coming up SOON, so stay tuned! These are vintage industrial trash cans made of solid metal. Each can has its own different color, aged patina, and textural pattern. Perfect industrial accent to your modern or vintage office look. This is an antique valet key holder. It is a rare item that has a beautiful industrial look and utility. It has some antique keys still hanging in it as well as the personalized touch of the handwritten labels. Unbelievably cool collector piece. Sold on a Picked Vintage sale on Fab.com. This is an antique military solid metal trunk that used to hold transmitters. It has a great patina that is beautifully intact inside and out, very cool descriptive graphics and rolls on wheels. 1 sold in a Picked Vintage sale on Fab.com. 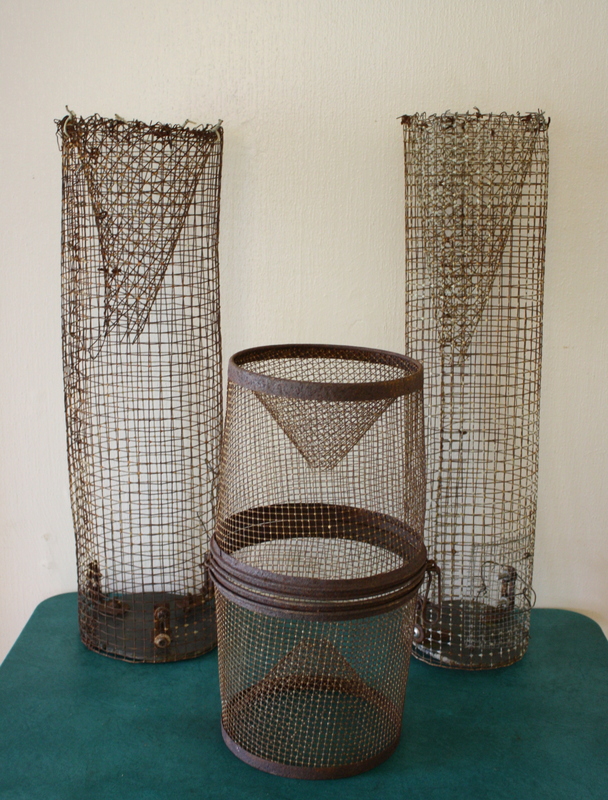 This is a set of 3 vintage fishing traps. They are made of solid metal and enhance a room’s nautical or industrial décor. 1 Set sold in a Picked Vintage sale on Fab.com. These are antique stacking wood and metal milk bottle crates from Pensupreme in Lancaster, PA. Each crate has its own beautiful rustic quality. We also have a rustic all metal crate from Lucerne in California. Great for storing and displaying your favorite books. 6 Pensupreme crates sold in a Picked Vintage sale featured on Fab.com. Rustic all metal crate from Lucerne is sold. These are two antique magazine racks made of metal. 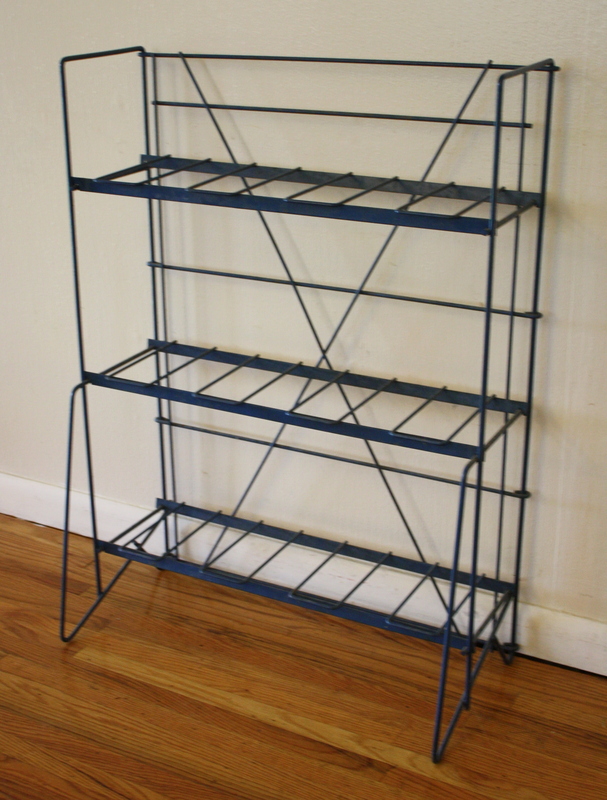 The blue magazine rack has a great industrial look and utility. The red rack has a great pop of color. The shelves are removable, and the racks are collapsible for transport and storage. 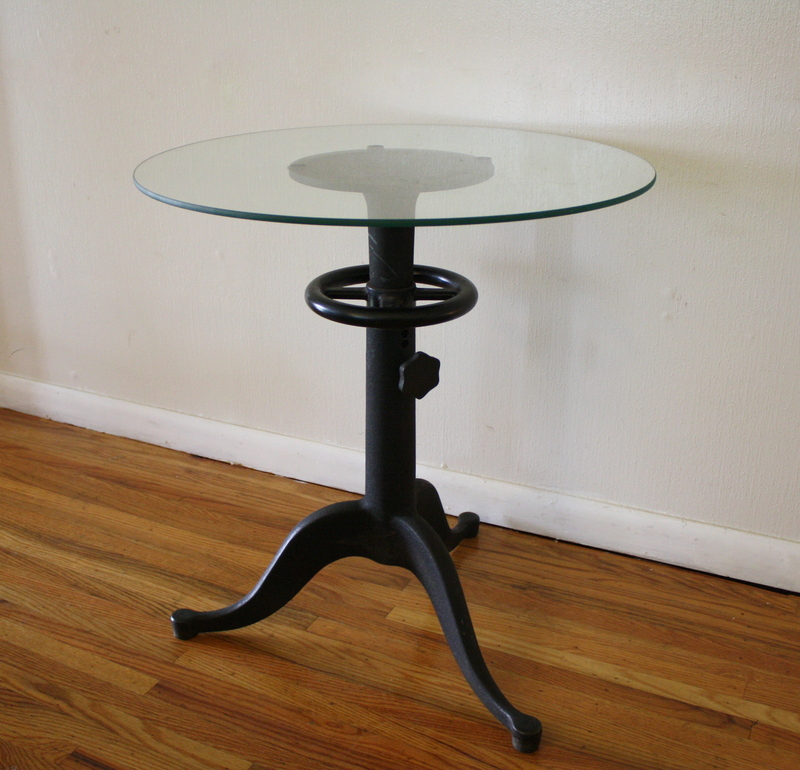 This is an antique cast iron table with a beautiful industrial design. It has a heavy cast iron base and a round glass top that displays and accentuates the tables design. Bring a little steampunk chic to your home. 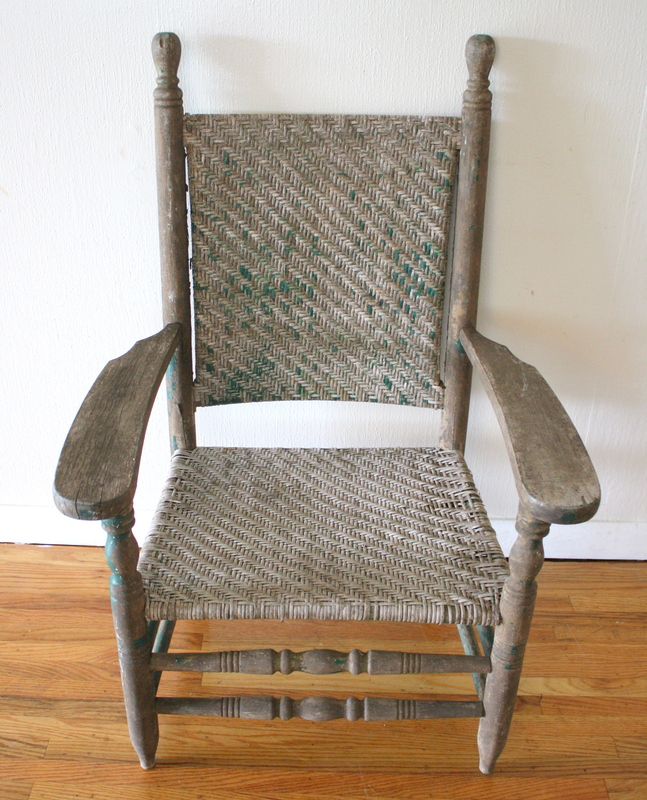 This is an antique primitive arm chair in great condition for its age. It is made of solid wood, and has a woven seat and back. Great farmhouse design with turned legs in the base and back and wonderful worn patina. This is an antique rustic step stool made of solid wood. It has a flip top and can be converted to a sitting stool or a side table. Reallly cool convertible piece with great patina. This is a rare antique mirror with a beautiful small painting of Mount Holyoke College. It is framed in solid wood and is in beautiful condition. Perfect accent for the enthused alumni, student or professor. This is an antique empire mahogany record cabinet with cabriole legs. It is made of solid wood, has a small top drawer and 5 shelves inside its cabinet. Classic clean design, perfect for your favorite vinyls. This is an antique sewing machine table base that has been paired with part of a rustic farmhouse taple top. The base is made of cast iron and made by the Standard company. The foot pedal depresses and turns the antique wheel easily. Gorgeous antique industrial look.